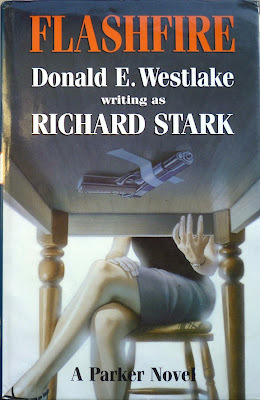 With Backflash (1998), the second entry in the second run of Donald E. "Richard Stark" Westlake's series of books starring coldblooded career criminal Parker, Westlake was firmly back in the Parker groove. It was a classic Parker heist tale: an intriguing target (a casino riverboat); a familiar crew; and a bloody aftermath. 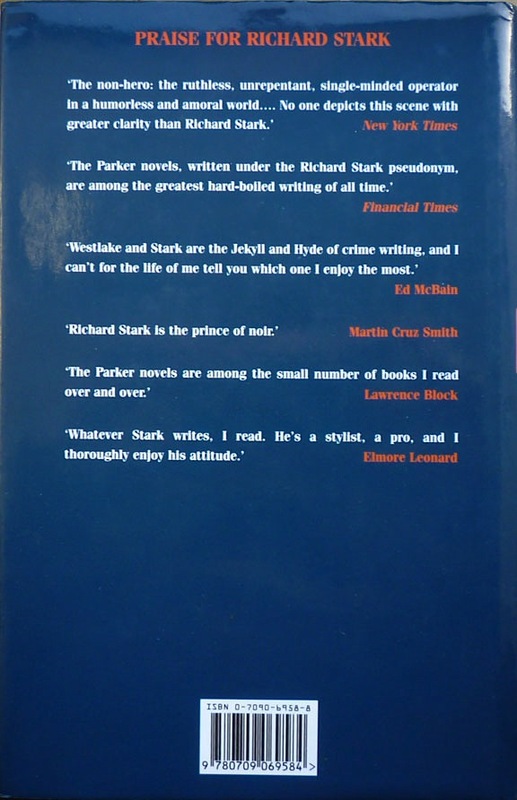 But there's another type of Parker tale, one where the heist, if there even is one, isn't the focus of the book; where Parker's on the back foot, foiled at every turn, scrabbling to retrieve what he can from a foul-up: books like The Seventh, The Sour Lemon Score, Plunder Squad, and even, going right back to the beginning, Parker's debut, The Hunter (1962), which opens with Parker double-crossed and penniless. 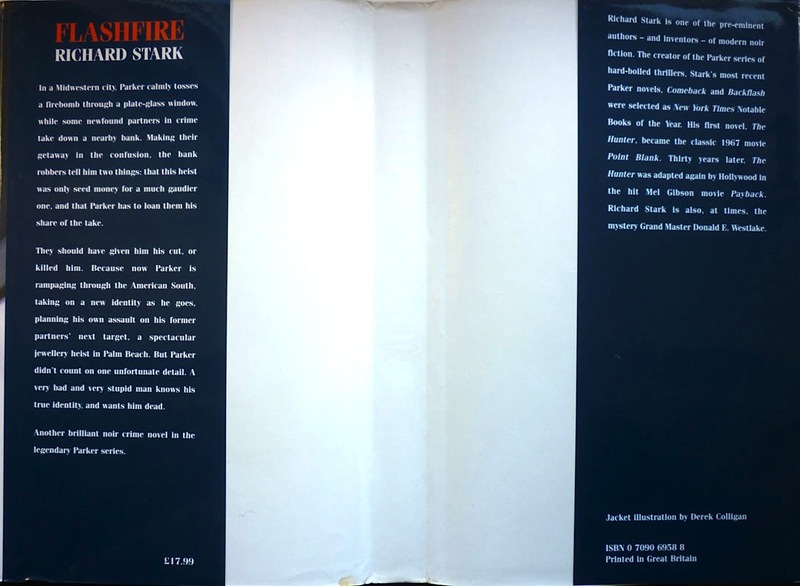 And joining these, the third entry in the second block of Parkers: Parker #19, Flashfire (2000). Flashfire has something else in common with The Hunter, too, in that we get to see Parker commit the kinds of crimes he prefers to avoid: small scores, taken down by himself, with the bare minimum of planning. Having been double-crossed (yet again) at the start of the novel, Parker finds himself in the position of needing to build up funds in order to get back at the heisters who've crossed him (and unwisely left him alive). And so he embarks on a trek across the States from Indiana to Florida – where his erstwhile compatriots are planning a jewelry heist – on the way robbing a gun shop, a check-cashing store, a drug-dealing operation, a movie theatre and a bunch of houses. This is Parker in the raw: stripped of cohorts, brutally efficient, driven by the same two interlinked aims as in The Hunter: revenge, and getting what he's owed. In the Parker series as a whole, it's the big, flashy take-downs that tend to remain in the memory – a football game; an entire town; an entire island – but in their relatively quiet way, these short episodes are as good as anything else Westlake wrote for the Parkers: clipped, economical, the crimes all the more believable for their simplicity. It probably speaks to something troubling in my character that it's these kinds of frustrating, erratic, oddly misshapen Parkers that I enjoy the most. They appeal to me in the same way that Elmore Leonard's work does: they're possessed of an understanding that it doesn't matter how smart, tough and proficient you are, like anyone else you can still take a wrong turn and wind up in a cul-de-sac – or, in Parker's case in Flashfire, a hospital bed. Time and again in Flashfire the signs point one way only to lead to somewhere unexpected, right down to the final confrontation with the men who crossed Parker, which sees him effectively sidelined. 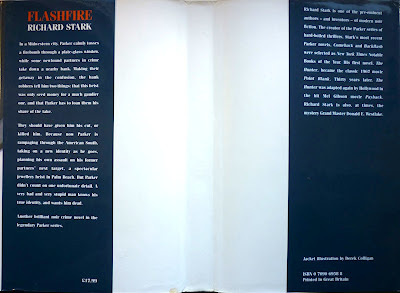 I suspect that Flashfire's idiosyncratic tendencies – plot strands derailed by the unforeseen and happenstance, violent scenes where the protagonist ends up being almost a bystander, tension pumped up only to be deflated at the last moment – is why the novel is less well liked than others in the second run of Parkers, but for me, perversely I guess, it makes it a more compelling book. Of course, quite what the makers of Parker, the Jason Statham-starring movie adaptation of Flashfire, due in US cinemas on 25 January, will make of all this remains to be seen (and will seemingly remain that way for me until March, as the film isn't out in the UK until then). I suppose it's unreasonable to expect a Hollywood production that's potentially the first instalment in a new franchise to take quite so many chances with narrative as the nineteenth novel in a series... but I live in hope. As I think I've mentioned before, this is the very first Parker I read (it came before all the other Parker novels the library I work at has to loan), and I liked it well enough to keep on reading--but the more Parker novels I read, the less I liked this one. I agree with everything you've said about it, and it should not be compared to novels like "The Score", but compared to a novel like "The Seventh", it comes up pretty short. I think Westlake wanted to really experiment--put Parker in Florida, where he normally only recreates. Have him wear disguises, play characters, which is something you'd expect from Grofield (though actually, did Grofield ever actually use his thespian abilities on a job?). He grows a mustache, wears a yachting cap (not a cowboy hat), poses as a clergyman, and he does it really badly. You essentially find out that Parker may be a terrific wolf in human form, but he's a lousy chameleon. It's a good book, but it's not what most people read the Parker books for, which is why it's puzzling that they chose it to kick off an intended (but probably abortive) film franchise. It's got a more contemporary feel to it--I guess that's one reason. And it's got a scene where an attractive 40-ish woman is made to strip--you just know they won't leave it there, and Leslie will be more than just an accomplice to Parker. Reread it a few weeks ago--the early part of the book works very well for me, but it loses steam as it goes along to its anticlimactic and somewhat over-contrived conclusion. I think I understand what Westlake is doing with it (he never wanted to write the same book twice), and as the 19th installment of a very long series, it works fine. But you know as well as me, they can't adapt this one as it stands. Parker doesn't get into a single fight. He terrorizes two helpless women at a movie theater. He's almost completely incapacitated for about half the book. He's not involved in planning a heist, just a series of quick smash & grabs. He does not show any sexual interest whatsoever in the attractive 40ish woman who strips in front of him. Are they going to explain about Parker's sexual cycle? Good luck with that. And there is a conflict in the book that I felt obliged to explain when I wrote about Parker--but I'm not sure I succeeded. If he's all about the money, then why, having accumulated so much more money than his rightful share of a bank robbery that they promise to get him later, does he then head down to Florida to risk (and nearly lose) his life trying to get even? Why not just hang with Claire at the resort, and wait for his partners to self-destruct? We've seen this type of behavior from him before, but this just seems a bit too much--Westlake pushing the envelope a bit too far, in his quest to find out what makes this guy tick. I think this time we get more questions than answers. I also note that we never see Florida again in the series. It's just not a Parker place. Travis McGee he ain't. You're not one for spoiler warnings, are you, Chris? There's me, keeping it all as vague as possible... Anyway, Parker does get to shoot someone else earlier in the novel – again, not much of a fight – in fact, no fight at all really – but it's there. And no, I'm not gonna say what it is and spoil it! Apologies, but it's not really that important a scene. Just setting up for later. Ah, but I don't reveal if Parker actually SURVIVES... Yeah, OK, fair point. There may be some way to discuss the merits of a plot-driven novel without actually discussing the plot, and please let me know if you ever come across it. I keep forgetting to mention that I like this cover--probably better than any I've seen to date for the series of Parkers that begins with Comeback and ends with Breakout. Not the highest praise I can render, but praise, nonetheless. It's a nice piece of work. 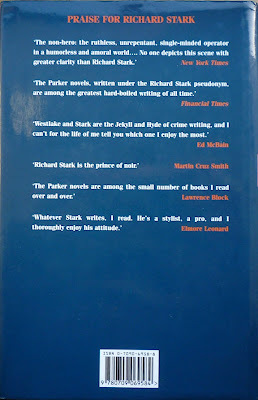 Personally, I still think it was a bad pick to start with, and it's low on my list of Parker novels I'd like to see adapted, but his arguments are not entirely unpersuasive. Though as he well knows, they are also entirely moot at this point. Nobody will ever adapt "Flashfire" again.